All items MUST be in their original condition, in their original shoe box, with original packing materials. Returns must be shipped in a suitable shipping box or bag (and NOT just the product packaging). Shoes must appear unworn and have unmarked soles - please try your shoes on a clean carpeted surface! All items MUST be in their original condition, in their original shoe box, with original packing materials. Returns must be shipped in a suitable shipping box or bag (and NOT just the product packaging). Shoes must appear unworn and have unmarked soles - please try your shoes on a clean carpeted surface! We will email you confirmation of your receipt/refund/exchange. If you receive an incorrect item, or we ship you a defective product then we'll fix the problem promptly and at no cost to you. Just contact us within 7 days of receiving your order at info@americanduchess.com or by calling (775) 238-3674. We will process your return/exchange free of shipping charges. 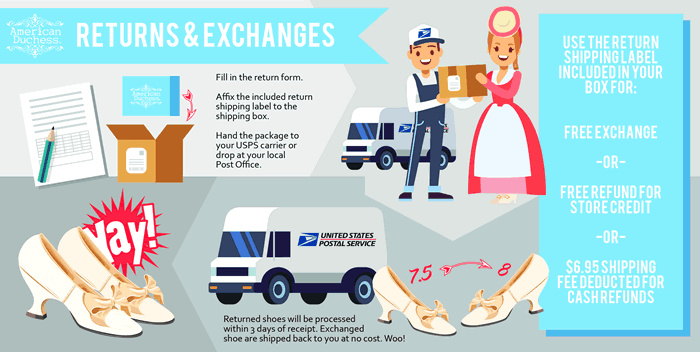 If you receive an item that has been damaged in shipping, please contact orders@american-duchess.com within 7 days of receipt, if applicable we will send a replacement product to you, and initiate a USPS claim for the item on your behalf. We will need photos of the damaged packing materials and items before we can process the exchange, refund or credit. Also, please hold on to the original packaging and packing material because USPS, in most cases, will need to inspect the items. If you are a domestic USA customer then we will send you a USPS return shipping label to send the damaged product back to us. If you are an international customer then your will need to pay for the return of the damaged package to us, however we will refund your shipping costs on receipt. If you have not received your order even after the tracking shows it was delivered, please contact us within 7 days to start a USPS tracer. All packages should be returned in the original shipping box (if serviceable), alternative shipping box, or padded shipping bag. We do not typically accept returns that are shipped in just the product packaging, and will refuse the package with the carrier. If the product packaging is damaged (from crushing, glue residue, labels or tape, tears, scuffs etc.) or missing then we charge a $20 reboxing fee for each damaged product package. If the products are damaged as the result of poor packing then we may either refuse the return, or refund the imperfect price of the product (if we are able to resell the return as an imperfect product). If an imperfect product is damaged to the extent that we cannot resell it in good faith then we will refuse the return and ship the product back to you. All products must be returned in their original packaging or shoe box. We cannot usually issue refunds for footwear that is not returned with it's original shoe box, as we do not stock spare shoe boxes. In the event that we have spare, matching shoe box then we will charge a $20 re-boxing and re-labeling fee for each box. If you purchased an item that came combined with a free or discounted item, then you must also return all of the items in order to receive a full refund. If you wish to keep an item that was offered as part of a discounted combination then that's absolutely no problem, and we will deduct the regular price of the non-returned product from any refund related to your return. Our premium and custom dyes (A24-A202) are a special order product and are specifically mixed for you when your order is placed. We are sadly unable to accept returns for exchange or refund. Our standard dyes (2001-2020, Jet Black) may be returned for exchange or refund in an unopened state. All requests to change or cancel an order should be made via email to info@americanduchess.com or by phone to (775) 238-3674 immediately. We pride ourselves in shipping orders as quickly as humanly possible, so you'll need to move quicker than us! An order that has already received shipping confirmation or tracking information cannot usually be cancelled. If you wish to return an item more than 60 days after receipt then please contact us via email at info@americanduchess.com or by calling (775) 238-3674. If the product is still being sold by us then we can often offer an exchange or store credit by prior arrangement. If you return an order that is shipped more than 60 days after receipt then we will either dispose of the items (without issuing a refund) or return the products to you at your cost.